ROM-5420 series SMARC module has an integrated Freescale i.MX6 Cortex-A9 SoC. 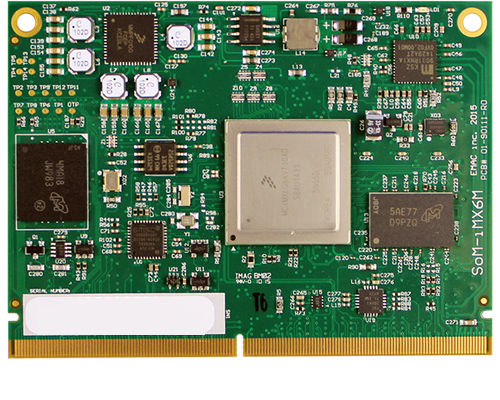 SOM-6763 is an embedded COM-Micro Type 2 CPU module that fully complies with the PCI Industrial Computer Manufactures PICMG COM Express standard. The new CPU module supports Intel N450 and D510 processors with ICH8M chipset which supports Intel Embedded Gen3.5 + GFX Core, MPEG2 Decode in HW, PCI Express and SATA interfaces. In a basic form factor of 95mm x 95mm, the SOM-6763 provides a scalable high performance and easy to integrate solution for customers' applications by utilizing a plug-in CPU module on an application-specific customer solution board. 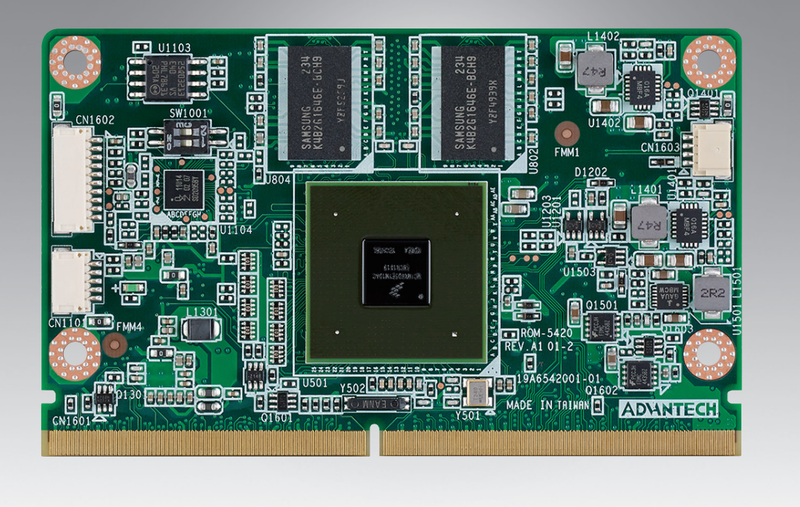 SOM-6763 is an embedded COM-Micro Type 2 CPU module that fully complies with the PCI Industrial Computer Manufactures PICMG COM Express standard. The new CPU module supports Intel N450 and D510 processors with ICH8M chipset which supports Intel Embedded Gen3.5 + GFX Core, MPEG2 Decode in HW, PCI Express and SATA interfaces. In a basic form factor of 95mm x 95mm, the SOM-6763 provides a scalable high performance and easy to integrate solution for customers' applications by utilizing a plug-in CPU module on an application-specific customer solution board. The SOM-6763 with advanced I/O capacity incorporates serial differential signaling technologies such as PCI Express, Serial ATA, USB 2.0, LVDS and HD Audio interfaces. SOM-6763 offers design partners more choices for their own applications needing higher computing speeds while maintaining a compact form factor. SOM-6763 complies with the "Green Function" standard and supports Doze, Standby and Suspend modes. The small size (95 mm x 95 mm) and use of one high capacity connector based on the proven COM-Micro form factor, allow the COM-Micro modules to be easily and securely mounted onto a customized solution board or our standard SOM-DB5700 development board. The SOM-6763 is a highly integrated multimedia COM module that combines audio, video, and network functions. It provides excellent performance through the Intel N450 and D510 processors, single channel LVDS interface for middle size TFT LCD display, DDR2 memory up to 2 GB (N450) or 4GB (D510), high definition audio interface (AC97/Azalia). On-board devices utilize PCIe technology to achieve outstanding computing performance.